Dr. Paul W. Codjoe, MD, joined Mercer-Bucks Orthopaedics after spending a year in private practice and another year in fellowship at the world renowned Hughston Clinic in Columbus, GA, where he specialized in arthroscopic surgery and minimally invasive joint reconstructive procedures of the knee and shoulder. Dr. Codjoe is board-certified by the American Academy of Orthopaedic Surgeons (AAOS). He specializes in Sports Medicine and General Orthopaedics. Dr. Codjoe was born in Accra, Ghana and came to the United States in 1989. He earned his bachelors degree from Rutgers University and subsequently attended Robert Wood Johnson Medical School. He finished his Internship in General Surgery and Orthopaedic Surgery residency at Temple University Hospital. During his training he has served as team physician for several high schools and a semi-professional hockey team. He has also given several presentations on various subjects and been an author of abstracts and articles within his medical speciality. 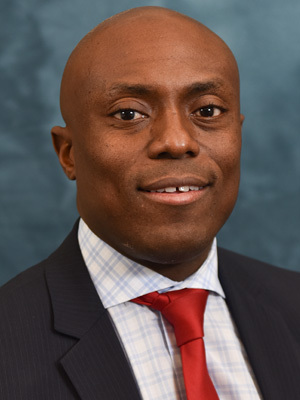 Dr. Codjoe is a member of several organizations including the American Academy of Orthopaedic Surgeons( AAOS), American Orthopaedic Society for Sports Medicine (AOSSM), New Jersey Orthopaedic Society (NJOS) and Pennsylvania Orthopaedic Society (POS). He enjoys spending time with his wife, who is a family physician, and his four children. His hobbies include traveling, weight lifting and golf. "Dr Codjoe and his staff are providing me with the medical attention I've been needing for quite some time. His early diagnosis put me at ease, and set the tone for my Physical Therapy. Beginning with Filomena at the reception desk the level of care I received was far exceeded my expectations. She always presented her self to be competent, caring, considerate. My PT Prathana Gururaj seemed to be in a constant state of motion. Though she assisted 3 to 4 patients at a time, none were denied the personal care we deserved. I was very pleased that on her off days Lisa was able to step in and not miss a beat. All in all the entire PT staff worked seamlessly together. I am so greatful, so thankful for the help I received." "Dr. Codjoe has excellent bedside manner. He is very professional and knowledgeable. He did such a remarkable job on my knee surgery that you can't even see a scar! He will always address your questions and spend enough time with you for office visits."